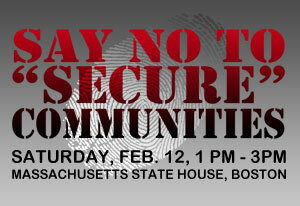 Sat., Feb. 12 in Boston: Say NO to the "Secure Communities" Program! Gov. Deval Patrick wants to join hands with ICE to spread fear in the immigrant communities of Massachusetts. Under the guise of public safety, “Secure Communities” targets mainly immigrants and people of color, mandating local police to cross check fingerprints of arrestees against the Homeland Security’s database in search of immigration status. Join us on Saturday, Feb. 12 at 1pm at the Massachusetts State House to voice your opposition to this racist program. Most of those detained and deported have been unlawfully arrested, arrested for minor offenses like traffic violations or ultimately had their charges dropped. Boston knows first hand about racist police. Boston’s African American community is no stranger to police brutality, or the racial profiling that will be extended by “S-Comm.” Suffolk County is the only county in the state where police currently participates in “Secure Communities,” and 68 percent of those detained and deported in Suffolk County have committed no crime. “S-Comm” is not about security. “S-Comm” is about racial profiling and terrorizing immigrants. It’s part of an overall effort to maintain a permanent second-class status for millions of immigrants workers. No to “Secure Communities” and all anti-immigrant programs! No human being is illegal — Full rights for all immigrants! Stop the raids and deportations now! Initiated by the Boston May Day Committee. Click here to see a full list of participating organizations. To endorse the Feb. 12 demonstration, click here.